Ever since one brave man invented videogames in 2009 with the release of the underground smash hit Minecraft, survival simulators have been all the rage. The majority of follow-ups in the genre have all strived to make survival competitive. Rather than focusing on outliving the elements, all that these games value is outliving the others around you. Solace Crafting seeks to subvert that, providing the survival experience without trying to cram combat into the mix. 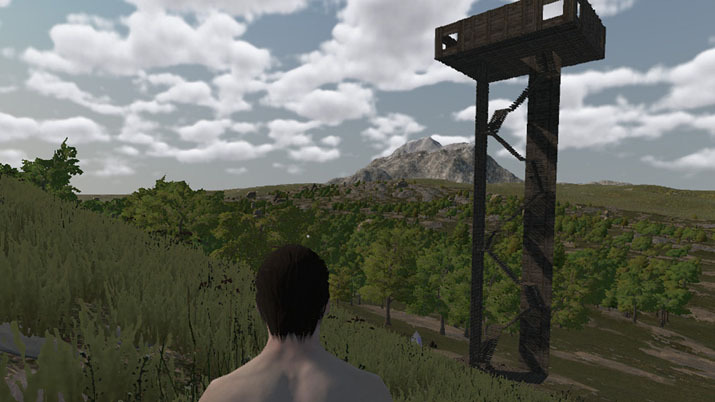 Similar conceptually to bigger games such as Ark: Survival Evolved or DayZ, the sole developer at Big Kitty Games has succeeded in creating a magnificent environment and the thrilling challenge of surviving in it. From the top of the game, players are well-informed that they are in for a treat. With some nostalgia-inducing graphics and a killer soundtrack to boot, the character customization is one of the best to come out of an indie game in recent history. Whether you want to be a particularly shredded but still pint-sized Smurf or a lanky goth man with legs that take up the majority of his height, this game lets you create the survivalist of your dreams, leaving the sky as your limit. Once your character has been perfected, you are thrown into an in-depth tutorial on how to make your way in the picturesque wilderness that is to come. Through this, of course, your character remains in nothing but a tight banana hammock, which stands to be one of the greatest character choices to come out of the 21st century. This tutorial introduces you to the goals you are meant to fulfill: craft, harvest, build, protect, survive. 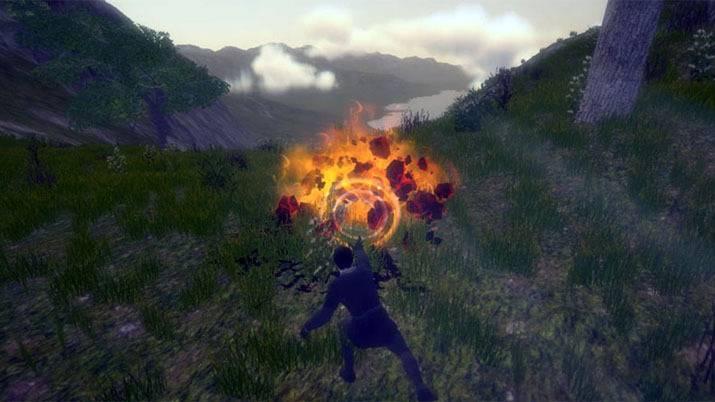 Solace provides a brilliant double-whammy of crafting and building mechanics. The most striking feature, naturally, is that the items you craft affect your character’s in-game appearance, a feature that developers include far too seldom. The crafting menus are intricate, yet simple to navigate. There are a great number of craftable items, each filtered into a section and subsection. This results in a many-branched tree of menus, yet the clear and clever interface allows tree navigation the likes of which only a lemur can match. The one catch in the otherwise magnificent mechanic is that some of the crafting components are hard to come by in nature, and it offers no way to distinguish what each component looks like or how to tell when you’ve found it. Similarly, the building functions in the game may have slight faults but still serve to make a brilliant game. The mechanics are equally intuitive, allowing for a quick start in the world of construction that will easily allow you to upgrade from a cubed hovel to a regal castle in no time. It can take time to get a solid bearing on where these pieces run off to after you will them into existence, but once you are centered and can keep track of where each wall connects, you can make a marvelous mansion to fulfill all of your storm-surviving needs. Of course, any environmental survival game is only as good as the environment you are to survive, and the world Solace Crafting sets is more than up to the challenge. Presenting players with an expansive open world, the game sets up a vast array of terrains, environments, and natural resources. The landscape is incredibly soothing to experience, making players at one with the realistic and seemingly-infinite expanse of nature. The weather only furthers the realism of the situation, summoning storms with such true-to-life effects that players will be utterly swept up and eventually forget that the storm is only on their screen. The game does have its flaws, but such is the nature of any game that isn’t Wii Bowling. Controls are a little finicky, as the screen is locked in one direction and can’t be moved without clicking and dragging. This can severely interfere with gameplay, especially since camera manipulation is relatively jerky, and it can take a few tries to land on the intended view. The graphics fall short of stunning, but can still provide a grand experience if taken representationally; despite the standards many recent games are setting, not everything needs to be easily mistaken for reality. Solace Crafting may have its glitches, but it is still in the very early stages and has incredible amounts of promise already. It makes a place for itself in the genre, giving a minimalistic spin that not many others can match nearly as well. Such a zen game has a lot to offer, not only to the genre but to game libraries everywhere.